If you have a child with special needs, you know that it can be expensive. We were recently reminded of this when our local hospital decided that our medical account had existed for too long. For the past five years, our son with autism had been receiving speech and occupational therapy through one of their clinics with weekly co-pays. Although we paid on the account faithfully twice a month, they decided to send our account to collections … to the tune of nearly $20,000 plus 18% collection fees. (Fortunately, I have a very calm and patient husband who has not been dealing with insurance, therapy and medical bills directly like I have for the last five years – and who did not work for the hospital that was sending us to collections like I did – and was able to speak with patient accounts and work out a mutually agreeable plan). So after you have paid for all of the therapy bills (because goodness knows ABA, speech, OT, physical therapy, vision therapy, etc. are not cheap! ), medical bills (because children with autism or special needs are also usually physically ill), and out-of-pocket bills (because many autism therapies and treatments are not covered by insurance), not to mention the extra costs of following a special diet (because children with autism often suffer from digestive disorders and can make great progress by following a special diet – they also often tend to have food allergies which require special diets), this leaves very little money left over for other things. So when your child’s therapist comes to you and mentions purchasing special sensory games and toys and you start looking on Amazon, you feel your wallet significantly lightening (or your credit card rapidly reaching its limit). And there are now SO many options out there for sensory-friendly items: weighted vests, chew toys and jewelry, blankets, sensory games, social apps, flash cards, and so, so much more. While we purchased a few of these in the early years, I have since learned that many of the common games that I played as a child can also be fantastic for children on the autism spectrum (especially those who are high-functioning). 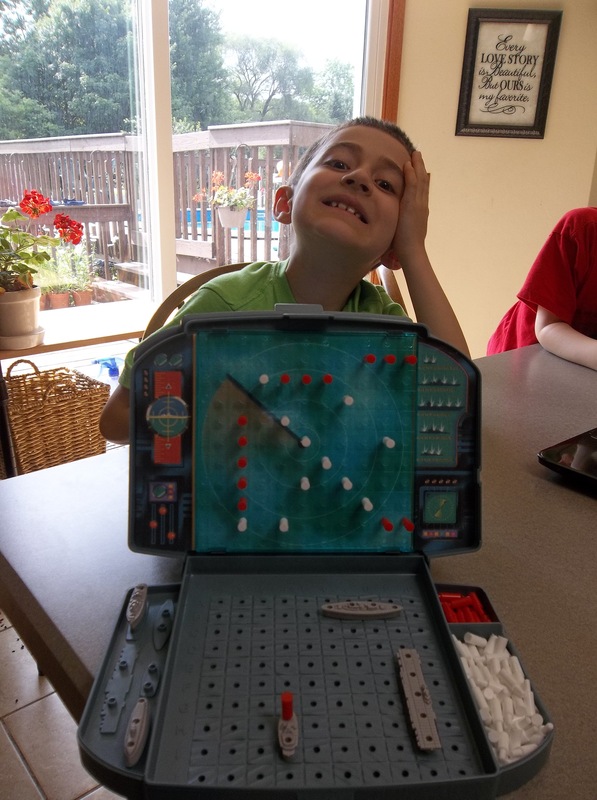 For example, today as I’m drinking my morning coffee and trying to get some work done before a very crazy upcoming week, my son comes to me and wants to play Battleship. It’s one of his favorites, and we found it at a garage sale for $1 (at the most – it may have even been 50 cents). One thing that I’ve learned since leaving my hospital job and staying home with my boys is that no matter how much work needs to be done, it will still be there tomorrow, and my boys are growing up rapidly. And so I dropped what I was doing and played a game of Battleship. Also, for a child working on fine motor control, it’s a great game, as they are working on their pincher grasp, precision in applying the pegs into the board and the ships, and so on. For kids who don’t like to lose, the game helps to gently ease them into the fact they may lose, which gives time for parents to prepare them for the end of the game. Usually the game is close or I lose (not for lack of trying 😉 ), but for some reason today every guess I made was a “hit”, so I quickly raced ahead. I ended up trying to slow down a little and finished up winning just one ship ahead. My son does much better with losing than he used to, but I still try not to completely demolish him when we play a game. He ended up losing, gave me a handshake and a “good game, Mom!” and went about the rest of his morning happy. Chess and checkers: My oldest son loves these games, especially chess. Many of our children with high-functioning autism think very logically and strategically, and chess provides a game with a great structure. Each piece moves in the same way every time. My son enjoys learning new strategies for winning the game, and he is quickly gaining on my chess skills. HedBanz: This was a game my son first played in speech therapy, and it was one we ended up buying off Amazon. Everyone wears a headband with a card in it, and you have to ask questions regarding the object on the card (that you can’t see) to try to figure out what it is. It’s wonderful for children working on expanding their speech and vocabulary, as they have to think of many different ways both to try to figure out the object, but also to describe an object to someone else (if the other player is wearing the headband) without giving away the object. It quickly became one of my son’s favorite games, and he will sometimes bring it out to play with guests who come to our house. Twister: This is a classic game that can be a lot of fun and can be modified as needed for our kids. Often children on the spectrum (even ones who are very high-functioning) have difficulty recognizing or giving attention to their body (which is something that we’re working on right now in PT). With this game, they have to learn which body part to place on which color and also figure out how to position their body just right so that they do not fall down. (This game can be played with others or the child can play alone if they are uncomfortable being in close proximity to others or touch. Gradually, the child’s comfort level can increase so that others can play the game with them). Puzzles: Putting puzzles together is a nice, quiet activity that is helpful for developing fine motor skills and helps with calming, focus, and a sense of accomplishment when completing the task. Another nice thing about puzzles: it does not involve competition, and it is a nice activity that parents and children can do together. Uno, Go Fish!, or other card games: My boys have recently discovered cards (Old Maid is another favorite) thanks to Grandma finding a bunch of old card games. Another great social activity for improved back-and-forth communication, asking questions, and problem-solving skills (also learning things like giving away the Old Maid card without announcing it first! 😉 ). These are only a few of the games that can be helpful for building skills on a budget. Also, so many everyday objects around your house can become sensory toys for our kids … heavy blankets, quilts and couch cushions provide deep pressure; the dining room table plus chairs can make an obstacle course that a child has to crawl through; scooters, riding bikes, going to the playground, a trampoline in the backyard (or small one in the house), swings, homemade chew toys, drinking homemade shakes using a straw (has a calming effect) … There are so many things that you can do at home on a budget! Google provides an endless supply of ideas (try Pinterest too). Today I googled “homemade sensory items” and had 428,000 hits. “Social games for kids” had 305,000,000 results! What games do YOU like to play with your child? I needed this reminder, thank you!